Thank you for the cool tool to promote kindness! Lovely! How wonderful that you share and teach so easily! Very clever Celeste! I agree…..we should make this a daily ritual. It’s been a terrific exercise for everyone I think. Celeste, I love the creative way you used each of the letters in the word kindness to give us reminders. I’m going to write them down and put them by my desk. Thanks!! Fantastic Celeste! How refreshing when we experience daily how kind people actually are! 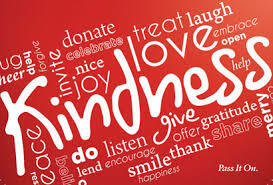 I love the creative way you used each letter of the word kindness to give us a reminder. I am going to write them down and put them by my desk. Thanks Celeste!! loved your blog~ especially the N.E.S.S. Nice job with the acronym !! Can’t wait to read more!